EDITOR’S NOTE: This is the second in a series of articles on the new institutions in areas controlled by the Syrian opposition in the liberated Eastern Ghouta area outside Damascus. These reports are designed to highlight the efforts of activists and local residents to fill the void created by the absence of state institutions. (Erbeen, Syria) — The level of civic engagement in the city of Erbeen is clear from the moment one enters the town. The roads are free of any armed presence save for the patrols of a police force charged with keeping the peace. There are no Free Syrian Army, FSA, checkpoints. Some streets are decorated with revolutionary paintings and slogans which were drawn as part of a clean-up campaign organized by residents and in which even some of the FSA battalions participated. Erbeen, is located seven kilometres northeast of Damascus. Groves of olives and walnuts are irrigated from a tributary of the Barada River that runs through town. Erbeen is home to about one hundred thousand people, some of whom are originally from the area and others moved there. After several waves of refugees left, about half the population remains, though the area has been on the front-lines of the war for the past six months and is subjected daily to bombing by air and land. Like other cities and towns of East Ghouta, Erbeen joined the revolution in the very beginning when it was a peaceful protest movement. When the revolution became militarized, Erbeen supported the fighters but without abandoning its peaceful mobilization. The Local Coordination Committee here continued to contribute to media coverage of the revolution and organize demonstrations, while the local residents formed committees to ensure the provision of basic services according to developments on the ground. It seems evident that the residents of Erbeen, and especially the local city council, have gone to great lengths to manage the affairs of their city. The council began its work in earnest in November of last year. It currently consists of an executive board of seven people, and a general secretariat where each of the council’s committees is represented. These committees function as “mini-ministries to manage life in the town,” said council president, Abu Ahmed. The general secretariat is made up of representatives from the 26 committees, as well as representatives from nine military battalions, and one member of the executive board. The plan, according to the president, is to replace the elected fighter representatives with a military liaison to coordinate communication between fighters on the front and civilians. The battalions have even signed a pledge promising to abide by and support the local council in any decisions concerning the affairs of the town, and to take into account the council’s consultation on military affairs, which affect the town. “We brief them on the policies of the council and its decisions, and do likewise with respect to matters that affect the lives of civilians,” said Abu Ahmed. Regarding the obvious absence of armed elements in the town, Abu Ahmed said the fighters stay on the front, and when they do take time off they are forbidden from carrying weapons among civilians. “We agreed that the military headquarters should be as far away from civilian areas as possible,” said Abu Ahmed. Even the office of military coordination, which is made up of battalion commanders, is subject to a special monitoring committee composed of representatives from the city council and the Sharia council. Some have even suggested removing the Office of Revolutionary Action from the city council’s purview. The Office of Revolutionary Action includes a member of the Local Coordination Committee and organizes demonstrations and other political activities. 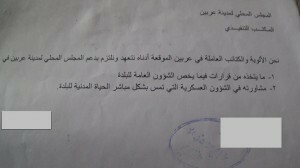 “We are in the process of separating revolutionary activism from civic activities, with each responsible for its respective field, so the office of revolutionary action will be separate from the city council but we will maintain coordination and cooperation between the two,” explained Abu Ahmed. The rest of the council committees are tasked with providing services to the population, such as setting up generators for certain areas, some of which have not had electricity for eight months. Another committee is responsible for transporting waste to temporary landfills. Moving garbage all the way to the primary landfill is very expensive. The council is also considering a project to generate natural gas from waste, as well as an initiative to clean the river where it has been blocked by the accumulation of debris from the bombing. The city council is still in the process of experimenting with the mechanisms and structures needed to carry out its work. It seems clear that the council was established based on a broad understanding between civilians and combatants, and till now there are no specific electoral mechanisms in place. Establishing such a mechanism by examining the experiences of similar local councils will be a top priority of the next legislative session. It is also worth noting that most of the committees lack younger representatives, perhaps because so many young men prefer to take up arms. There are also no women on the council, although there is a special office for women and children. And, as is the case everywhere else, the council lacks resources to implement its projects and provide services. Material support is also crucial if the council is to maintain its independence.